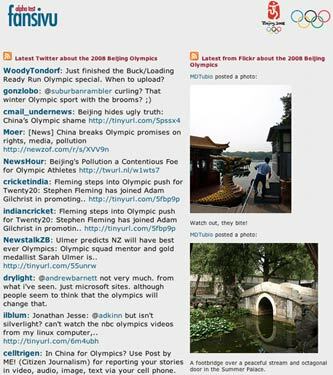 As well as Olympic Chipwrapper, I've made an Olympic version of Fansivu - my one page aggregator of user-generated content around a sporting event theme. 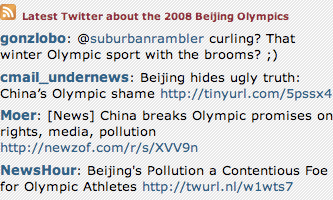 Olympic Fansivu picks up the latest chatter from Twitter about the Olympics using Tweetscan, and adds links to the latest blog posts appearing on Technorati about the Beijing Games. Photos are automatically pulled in from Flickr, and I've tried something different this time from my Euro2008 Fansivu. Rather than blending a couple of tags using Yahoo! Pipes, I'm trying to give priority to photographs in Flickr that are tagged 'olympics' AND 'beijing', or are tagged 'olympics' AND 'china' using a bit of duct-tape Perl. 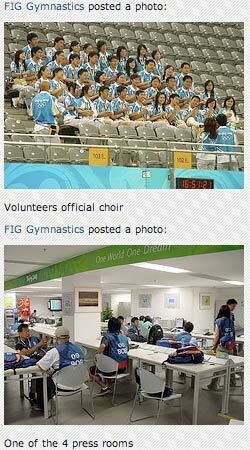 I'm hoping this way that the pictures will be more focussed on what is actually happening at the Games, rather than general Olympic-themed pictures from around the world appearing. It will be interesting to see how that pans out during the course of the event. 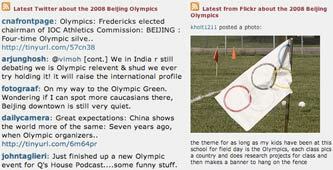 By Martin Belam on 7 August 2008.